Functional organic liquids (FOLs) are unique, in that they can flow and act as a solvent, while still being able to act as semiconductors or retain efficient emission properties. FOLs can be formed when long branched alkyl chains, are added to key functional organic moities such as pyrene, fullerene-C60, anthracene (etc.). The bulky and flexible groups pack poorly and disrupt π–π interactions between the functional part of the molecule, leading to a significant reduction in the melting point and consequently FOLs are oils at room temperature. In a recently published (open access!) paper (Chem. Commun., 2016,52, 7344-7347) we’ve looked into the possibility of forming oil-in-water microemulsions with a newly developed pyrene-based FOL , which is shown below. Why oil-in-water microemuslions? Well, asides from the basic fact that this had not been done before (and could therefore lead to unforseen benefits), the liquid pyrene shown above has a very high fluorescent quantum yield (i.e. in comparison to the amount of light absorbed, the amount of light emitted is pretty high – around 65%). Comparmentalising and dispersing this oil in water may lead to an effective contrast-enhancing agent for fluroescence microscopy, which is commonly used by biologist and medics to look at cellular structure (etc.). For some idea of the kinds of images that can be taken using fluorescence microscopy, see the wikipedia page. To summarise the results, we successfully formed microemulsions using the liquid pyrene, a surfactant (C12E6) and used small-angle neutron scattering to investigate their structure (droplets; short cylinders). Inside the droplets, the bright fluorescence of the pyrene derivative was retained. Interestingly, the emission colour changed with droplet size, which can be easy altered by the concentration of the 3 components. While we’ve yet to show that this new system can be used in imaging, other researchers have used nanoemulsions containing fluorescent dyes or quantum dots for contrast enhancement. The FOL-in-water microemulsions may have benefits over those system in terms of biocompatibility, long-term stability, ease of formation or brightness. We will continue to investigate these possibilities in further work! I’m on I22 (small-angle X-ray scattering beam-line at Diamond Light Source) at the moment with Zoe and Ashleigh from the Schnepp group and data reduction/analysis maestro Brian Pauw, who’s joining us remotely with a 8 hour daytime shift thanks to being currently sat on the other side of the world. To learn more about small-angle scattering experiments either see my dedicated page or check out Brian’s excellent descriptions. Very happy to report that research that I’ve spent the past 3 years amassing was published as an “advanced online publication” by Nature Chemistry on Sunday evening. The work focusses on extending the concept of amphiphilic self assembly to fully hydrophobic molecules. Amphiphilic molecules work because they have two parts – one is hydrophobic (water-hating) and the other hydrophilic (water-loving). We exploit this in cleaning applications: the hydrophobic parts adhere to any dirt or grease particulates and the hydrophilic parts allow them to be more easily dispersed in water. The molecules that we use are not amphiphiles in the conventional sense, in that they don’t have a hydrophilic part, but do possess two parts of different solvophilicity (two parts that like different solvents): long fatty chains (alkane moieties) attached to a π-conjugated part (for example, fullerene-C60). This makes them hydrophobic amphiphiles! What we’ve done in the research is show that these hydrophobic amphiphiles self-assemble in much the same way as their more conventional counterparts. Potentially any kind of π-conjugated molecule could have this method applied to them, and work in the near future will look to generalise as much as possible. One area in which this research could find immediate applications is in the burgeoning field of molecular electronics. Carbon-based electronic devices, which typically have π-conjugated molecules as the active component, could be much cheaper to manufacture than conventional silicon semiconductor technologies. They could lead to flexible circuitry that would be far less fragile than current solid-state gadgets such as mobile phones and tablet computers. This work is additionally highlighted in a few interviews (BBC WM radio – go to 01:48:00 – and BBC Midlands Today TV), plus press releases and highlights here, here, here, here and here. Beth Dobson, who has just finished her second year of study in Keele Chemistry, has obtained an RSC Undergraduate Research Bursary to carry out a placement in the Shelton lab at Keele this summer. This is a prestigious, competitive award, so congratulations go to Beth for her success! In addition to the main work, which will involve the synthesis and characterisation of the C60 derivatives and preparing composite materials with solvent or C60 additives, it is hoped that Beth will also visit the University of Birmingham and ISIS to perform small-angle X-ray and neutron scattering to determine their assembly structures. 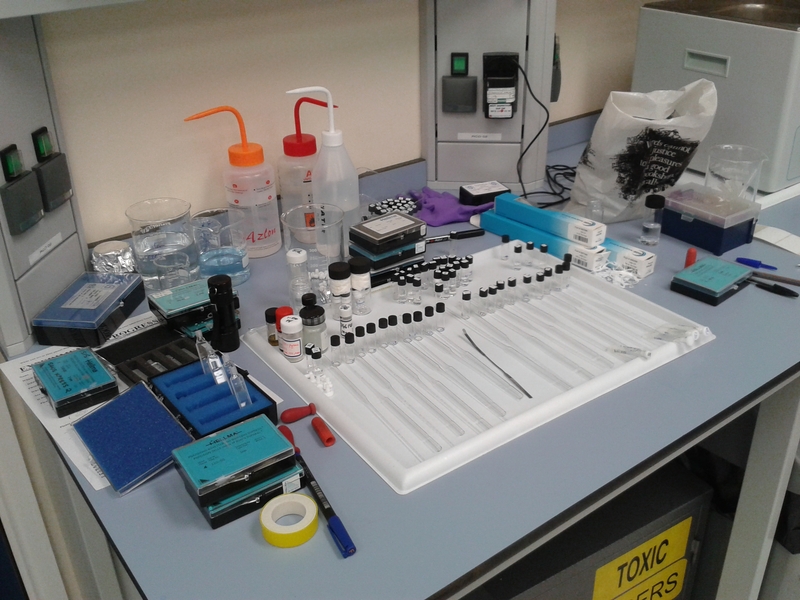 February mainly involved writing up results, some (relatively frantic) organic synthesis and helping final year project students Esther and Matt complete their experiments. The good news is that by the end of the month I’d finally found a decent route to produce alkyl-pyrene molecules, via several classic synthetic steps (e.g. 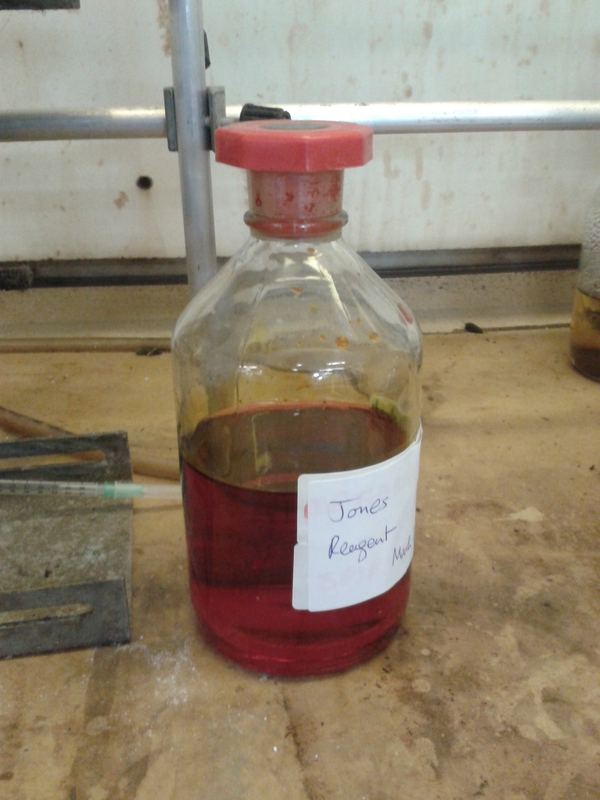 Jones oxidation, Friedel-Crafts acylation, Clemmensen reduction). One result of this is that now got a bottle of hexavalent chromium (I’m not going to dispose of in the sink) in sulfuric acid at the back of my fume hood. Don’t touch! March quickly became busy. First on the menu was a 2-day SANS experiment on the LOQ beamline at ISIS. The experiment looked at the structure of oil-in-water microemulsions – dispersions of nanometre-sized of droplets of oil in water, stabilised by a surfactant. In this case, the oil phase was a liquid alkyl-pyrene. We were looking for changes in the SANS with increasing oil content, as the droplets would be expected to become bigger (simply because there is more oil, but everything else stays the same), which is what we observed. Cue lots of tiny sample bottles containing solutions with slightly different compositions (and pipettes lined up in the “Mutch” style – see photo). Write-up (and with it, more info) to come over the summer. Thanks go to local contact Sarah Rogers, plus Zoe and Ashleigh from the Schnepp group in Birmingham for all of their help. 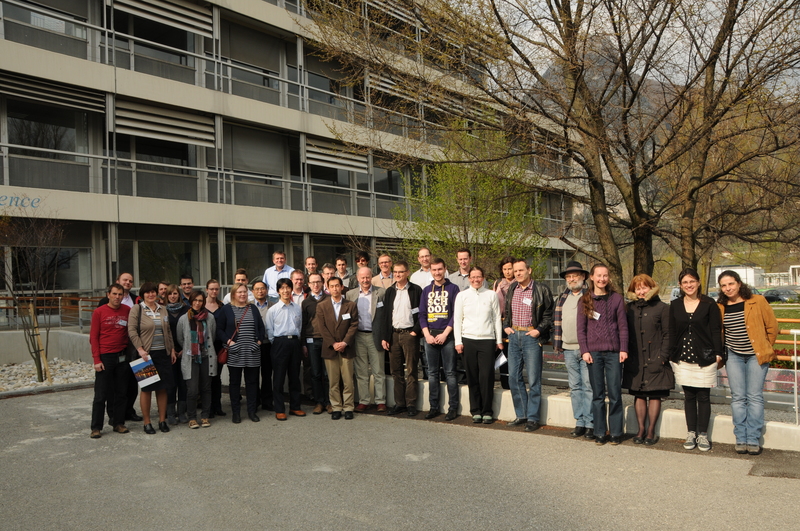 To complete a fairly SANS-focussed month, I attended the Studying Kinetics with Neutrons conference at the Institut Laue Langevin (Grenoble, France). I presented work we’d carried out a couple of years ago (actually, the last time I’d been at the ILL), looking at the formation mechanism of mesoporous silica nanoparticles, alongside some of my more recent results. The conference was enjoyable, with attendees having a relatively broad range of backgrounds but a shared common interest (we all love neutrons). I particularly enjoyed meeting and chatting with other younger scientists, including rheology specialist Simon Rogers and neutron reflectivity guru Andrew Nelson. The frogs’ legs on the conference dinner menu went down even better in good company! Big thanks to the organisers for inviting me to attend this event. 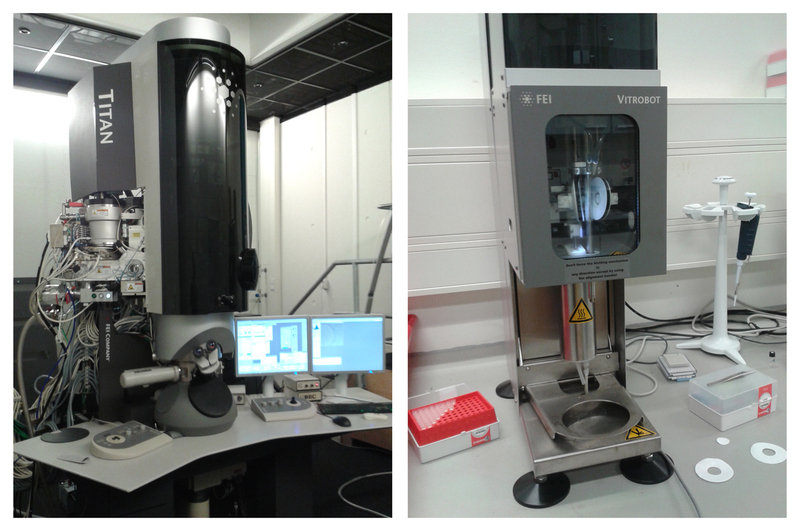 After starting 2014 by moving house, January saw me travel to the Netherlands to work with world renowned microscopists Nico Sommerdijk and Paul Bomans at the Technical University of Eindhoven. The aim was to get some decent transmission electron microscopy (TEM) images of assemblies formed by hydrophobic amphiphiles containing C60 (more on the results of this soon). For the assemblies formed in solvents, in order to preserve the relatively loose assembly structures cryo-TEM was used. In this case, the sample is quickly frozen in liquid nitrogen, then imaged in the frozen state. Despite being tricky, primarily due to the difficulty of sample preparation using organic solvents, the experiments were a success! 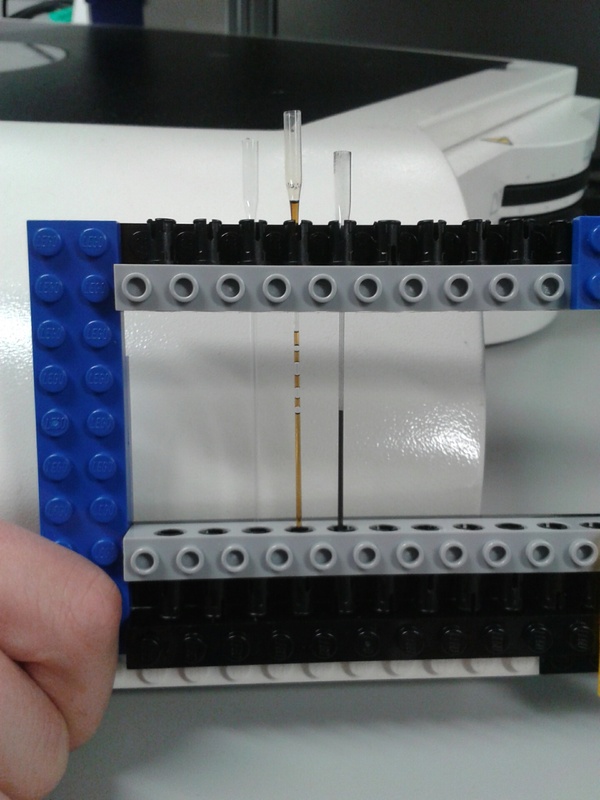 For those who are interested in top-class equipment, see the photos below of both the Titan microscope (complete with a cryogenic sample changer!) used for imaging and the Vitrobot used for the freezing process. Thanks to both Nico and Paul for their expertise, for hosting me for the full week, and for taking me some fantastic images.